When developing inkjet inks, one needs to be sure that all the materials that are in contact with that ink will not suffer or disintegrate. Therefore it is very important to do ink/material compatibility testing of printhead components, tubings, ink bottles or cartridges. 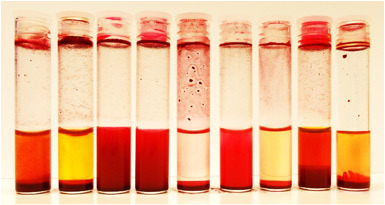 Usually these tests are done by soaking the materials in the ink for some time at an elevated temperature, and measuring their dimensions and weight before and after. On the other hand, if the composition of these materials is known, ChemStream uses the HSP’s for predicting the risk of incompatibility with the ink upfront. Figure 3 above shows us the position of polypropylene (PP) and polyoxymethylene (POM) in the Hansen solubility space with their solubility spheres. 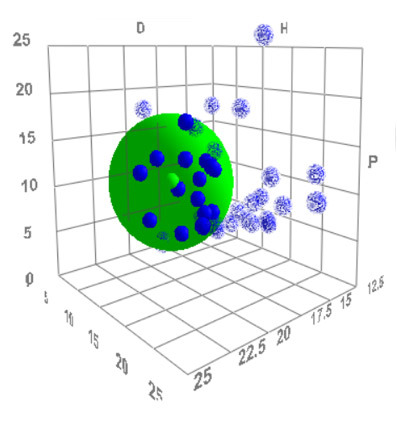 The blue dots represent some standard UV-curable monomers that are used in UV-curable inkjet development. One can easily see that the solubility sphere of PP has almost no overlap with the monomers, while the solubility sphere of POM comprises all monomers. This means that POM will be very sensitive to attack by these monomers, while PP will be much more resistant. These results provide ChemStream with knowledge that helps them to make faster and better choices in their ink development and process requirements.